For a political writer renowned for his commitment to realism–to real politik, indeed–it’s remarkable, and surely significant, that Niccolò Machiavelli should open and close The Prince with a couple of extended metaphors. The resort to literary tropes frames what is otherwise often taken to be the founding text of a political “science” that simply tells it as it is, without ideology or obfuscation. After all, Machiavelli himself tells us in his preface dedicated to Lorenzo de’ Medici: “I have not ornamented this book with rhetorical turns of phrase, or stuffed it with pretentious and magnificent words. [. . .] For my intention is that this should be a book without pretensions” (5). The frame, however, turns out to be rather more decorative than this preface (itself in point of fact hardly lacking in rhetoric) admits. And it’s perhaps precisely because this surprisingly gilded frame is in tension with what it contains that it’s worth further investigation. On first sight, the metaphor with which the book concludes is conventional and, however disturbing, frankly not that interesting: “Fortune is a lady,” Machiavelli reports. Hence “it is necessary, if you want to master her, to beat and strike her” (76). Yet it’s precisely the conventionality of the image, or rather conjunction of images–of both the fickleness and the subservience of women–that reminds us that for all his originality and scandalous novelty, for all of what Louis Althusser terms his “solitude,” there are plenty of ways in which Machiavelli is very much of his time, part of the crowd. This is an image of an image, of the ways in which images are produced: it is a representation of the proper process of representation, an analysis of how best to analyze. Moreover, it concerns the proper perspective or point of view from which images, representation, and analysis should be drawn. One might ask immediately from which standpoint is this image itself drawn, which after all takes in both the mountain and the valley and purports to compare both. Doesn’t this already indicate the strange slippage in Machiavelli’s work: that he presents it as though envisaged from the valley, from the humble advisor; and yet he needs endlessly to imagine how things look from the mountain, to identify with the view of the prince. At issue here is the place of the book and Machiavelli’s theory itself. Why would the virtuoso, the man gifted with virtù, need a guide like this at all? He who is sovereign should surely not have to depend on another; he who is decisive should not waver by looking for advice. 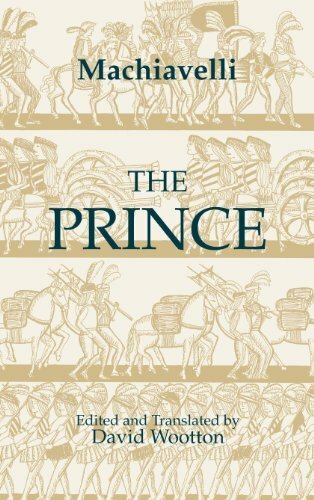 The book is called The Prince, not “The Prince and His Advisor.” The prince should be singular, independent, and free. And yet it seems he is always haunted by his shadow, by the man who can see from the valleys and acts as a mirror in which the ruler can see his own reflection but in that same moment is divided, distanced from his own image of himself. Equally, as the prince follows the advisor’s counsel, so he begins to reflect him, to take on the attributes and characteristics of the lower man. A strange and dynamic symbiosis emerges, in which the true source of influence and power becomes increasingly obscured. However much Machiavelli tries to resolve this tension, it persists and even colours his infamous reputation. Who, after all, is more fully Machiavellian, more the “Machiavellian type”: the heartless prince or the sinister advisor? Marlowe’s Duke of Guise of Shakespeare’s Iago? Nixon or Kissinger, Blair or Campbell, Bush or Rove? Should we fear the cruel autocrat or the eminence grise? Is it enough to say that one could not subsist without the other, that the prince is thereby doubled, his sovereignty fatally split? Or perhaps it is more to the point to note that sovereignty is always split, always both lacking and excessive, and that without that essential fissure it would not exist. And would it be too quick to identify this doubleness at the heart of sovereignty, enabling and yet undoing its basic claims, with the perpetually unresolved tension between constituent and constituted power?